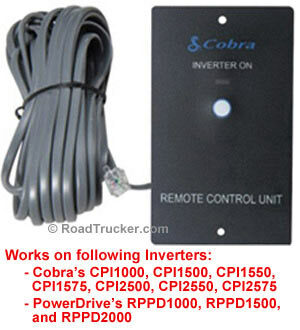 Cobra Power Inverter remote switch is a remote on/off switch for the Cobra larger Inverters. It is also compatible with PowerDrive Models RPPD1000, RPPD1500 and RPPD2000. Cobra's Remote Switch includes 20 feet of wire with a 4-pin plug to plug directly into your inverter making it very easy to install. For those off the grid, it can also be installed in your home just like an outlet in the wall. It lets you turn on your inverters while it is mounted out of reach and out of sight. At a touch, you can turn your inverter on to use it and then off to keep from draining your battery.